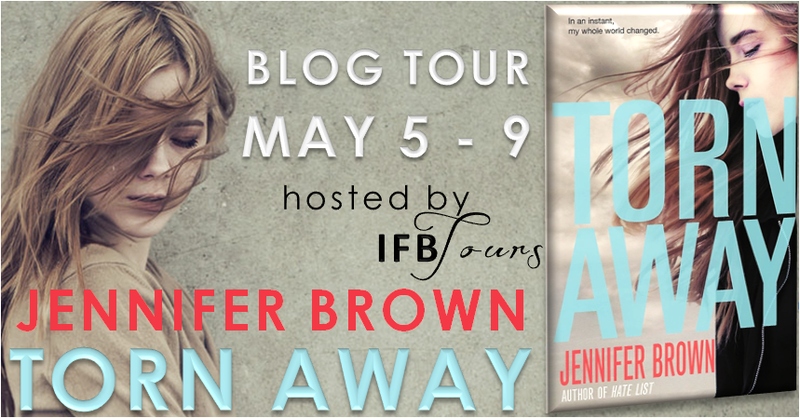 Welcome to my stop in the blog tour of Torn Away by Jennifer Brown. I'm so happy to be part of this tour because I loved this book and I think you should have the chance to know about it. I have my review to share with you, but there are more reviews and interesting thing in the other tour stops. To check them out, make you to stop by Itching For Books and check the blog tour schedule. The summary of this book is really clear. But let me tell you something. Torn Away is a very deep and serious read. At least I feel it that way. This is the story about a girl that looses everything after a tornado. I never read any book like this, and to be completely honest I’m really surprised by how much I liked it. Yes, this is a serious topic, but Jennifer Brown’s writing is awesome and I found myself addicted to her words. Torn Away is a sad book. It’s heartbreaking and tragic. But it’s also hopeful and realistic. Jersey, the main character is a strong girl. She’s real and her feelings are so naturals that you can feel like you’re next to her, living all the losses, the guilt, the grief. This book is touching, I cried so many times with some scenes, especially with the ones related with the family. I stopped reading some times to think about what I was reading, because it feels so real and tragic. I have been in some natural disasters, mostly earthquakes, and I remember how it felt to be scared, to feel lost and terrified of the future. I never lost someone but I met people who did. I’ve seen the devastation and all those feelings… and all those scenes were amazingly described in this book. I loved that Torn Away doesn’t have a love story that ruins the essence of the plot. Jersey learns to heal slowly and there were people helping her, making the story even more credible. Jennifer Brown created a cast of great characters and a story unique, tragic and beautiful. 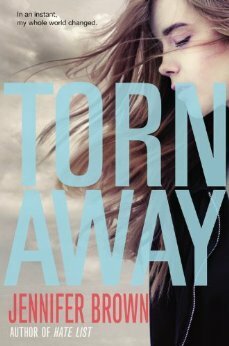 Thanks to the publisher you have the chance to win a paperback copy of Torn Away. This giveaway is US Only, but you have the chance to win 1 book in each stop of this tour.